Between the years 1680 and 1730, the Colony of Virginia suffered a “plague” of piracy, which was only ended by the strong efforts of the British Navy. Between the years 1680 and 1730, the Colony of Virginia suffered a “plague” of piracy, which was only ended by the strong efforts of the British Navy. 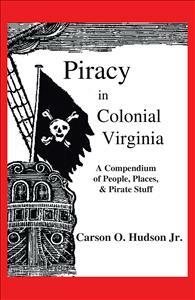 This compendium is an effort to separate fact from fiction and list the known historical details into a quick reference form, revealing the real pirates that once ravaged the shipping and coasts of Colonial Virginia.